I have said it often, Monday will be the start of my new program. Be it a commitment to eating more vegetables or a path to a more organized work schedule, I keep thinking that one magical start day will bring the path to success. Unfortunately without a tangible goal to hold me accountable, the change is finite. It doesn't make a shift in my lifestyle. 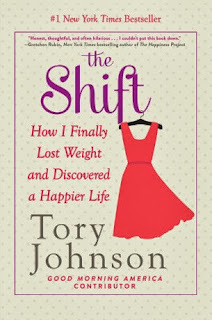 Recently, I was given the opportunity to review The Shift, How I Finally Lost Weight and Discovered a Happier Life, by Tory Johnson. I don't know about you, but when I look at television personalities, I assume that their lives are golden. From the dream job to the high lifestyle, every day must be full of rainbows and butterflies. This book examines how one successful woman conquered her weight battle once and for all by making a shift. While many women battle weight issues, the concepts in this book can be applied to any situation. Of course, if you are on a weight loss journey, this book can be a great support system along the way. This book is a support system, not a diet plan. Ms. Johnson's story is about kicking a lifetime of self-sabotaging habits to feel better about herself. The Shift, How I Finally Lost Weight and Discovered a Happier Life can be purchased on Amazon.com and other retailers. Tory Johnson is a contributor to Good Morning America, as the Deals and Steals segment, is the founder and CEO of two multi-million dollar companies, magazine columnist and happily married New Yorker with twin teenagers. When your life is a at cross roads, which path will you take? Commit to the path that will provide a happier, healthier, complete lifestyle by making The Shift. Looks good! With weight loss, any kind of life change, you have to conquer it in your mind/change how you look at things! Sounds like a healthy, well-balanced approach! Tory Johnson has such an inspiring story. I loved listening to her speak at her conference regarding business and think this book looks just as inspiring. Thanks for sharing. I'm glad you shared this, I'm looking for some healthy encouragement to lose quite a bit of weight! This looks like a great book. I know I need some sort of shift. I will be looking into this book.